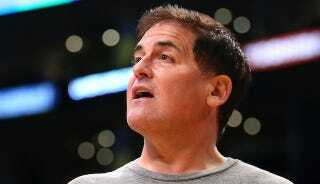 Mavericks owner Mark Cuban has more to say about losing DeAndre Jordan to the Clippers, specifically ESPN dingus Chris Broussard’s reports that he was driving around Houston like a madman trying to find Jordan’s house on Wednesday night. After all the nonsense coming from an ESPN employee on twitter, I thought I would provide the events of the day on Tuesday. Through all of Monday [DeAndre and I] were texting back and forth discussing players available, the amount of cap room we had left. Who our staff liked. Who he liked. How excited he was. Then on Tuesday the communications basically stopped and we started hearing rumblings from multiple people that something was up. So I flew down to Houston and got a room at the Galleria, which is just a few minutes from his house. I had my driver take me to his house. It’s inside a small gated community but the gate was wide open so we drove in and I literally walked up to his door. There was no one home. So I texted him saying that I was there, “I know something is up. Let’s talk.” He texted me that he was on a date. I told him to have fun. I wasn’t in a rush, that I was happy to come by there and say hi or if he wanted to make the date fun, take them to Dallas for a night out.